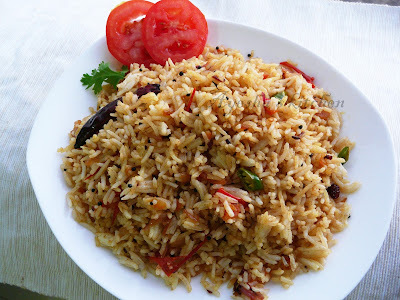 Tomato rice is a rice variety meal that can be made quickly with very few handy ingredients. Such rice varieties are made when we have some left over rice and once cooked and thoroughly cooled rice is best suited for such varieties. 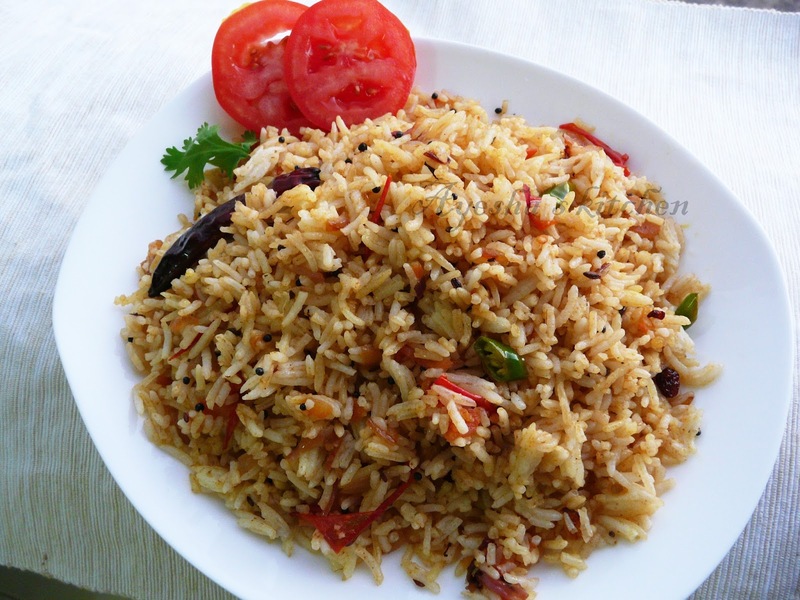 This is the most popular South Indian rice and is also known as Thakkali sadam. Tomato rice is a delicious, flavorful, healthy dish which is good for kids lunch box too. You can serve this tomato rice with spicy potato fry, raita, chips etc.. I used basmati rice in this recipe and you can also make tomato rice with normal raw rice. Here is my recipe of tomato rice/tomato sadam which I inspired from Dessana recipe book. Loved her rice varieties and hope I can try and share her other rice varieties soon. Soak the basmati rice or any regular rice in water for 30 minutes and then drain the rice and keep it aside. Now heat a vessel and add some oil. Splutter mustard seeds and when done saute onion till golden along with cloves, cardamom, and cinnamon. When done add green chili, ginger garlic paste, and chopped tomatoes. Cook till the tomatoes are done and the oil separates in a medium flame. Then add the chili powder, turmeric powder, coriander powder, cumin powder, chopped coriander leaves, curry leaves and salt. Now add 1.75 cups of hot water and check salt. Cook till the water dries out. When done, remove from flame and once cooled mix well.